WSET Level 2 - Saturday Number 2 and the journey continues!! We’re in week two of the WSET Level 2 course and things are in full swing. Last week we learnt how to taste wine and heard about the natural and human factors that affect its style – from the characteristics of the grape itself, to the climate in which it’s grown and finally the many choices the winemaker makes during the processing phase. We then moved on to the grapes themselves, and were introduced to Chardonnay and Pinot Noir. This week we’re picking up where we left off and meeting a lot more grape varieties. Whilst I was broadly aware of different grapes before doing the course, today was a bit like being introduced to a lot of people you’ve heard of but never actually met before – I finally put a ‘face’ to a name for grapes I’ve always know of, but little about. Of course, wines don’t always contain a single grape, and we discovered why some of the most common blends work so well. I’d never realised it, but, in some ways, winemaking is like cooking or even marriage. Some grapes have more pronounced – and potentially harsh – personalities whereas others can sometimes lack a little panache when found alone, but serve as a helpful moderating influence in partnership with another grape. The right combination can therefore prove to be ‘just right’, with the different properties complementing and balancing each other, as is the case for Cabernet Sauvignon and Merlot, or indeed Syrah and Grenache. In both of these blends, the former provides structure in the form of tannin and acidity, as well as pronounced fruit flavours. The latter, on the other hand, stops the wine being austere by bringing more body and alcohol to the mix. We see the benefit of this in the difference between the somewhat bland Merlot we taste and the more intense (and dangerously drinkable) Bordeaux Supérieur blend of Cabernet Sauvignon and Merlot – the perfect way to round-off the morning before lunch. After a glass of Austrian wine and a bad-for-the-body but good-for-the-soul amount of cheese, we tackle two different white grape varieties – Sauvignon Blanc and Riesling. Comparing the two gives us an interesting insight into the commercial side of the wine world; Sauvignon Blanc is successful because it is widely known for being clean, crisp and refreshing, an expectation it consistently delivers on. Riesling, on the other hand, is widely appreciated amongst wine connoisseurs, yet little known amongst consumers, many of whom are unaware of its (numerous!) qualities. When we taste two Sauvignon Blancs, we see for ourselves why certain regions stand out from others for producing good wines – the 2015 Sancerre (from the Loire Valley in France) is dry, acidic and the crisp notes of grapefruit, green apple and hint of minerality all linger pleasantly in our mouths for quite some time after the wine has gone. It’s long-lost cousin from New Zealand fails to equal its balance and complexity, however, and no sooner have we swallowed than the flavours vanish. Whilst certain areas in New Zealand hold a justified reputation for premium wines, this example, judged ‘acceptable’ by our class, comes from an area near – but crucially not quite in – Marlborough. Disappointing, as in fact, wines from this area are usually even more aromatic than their Loire Valley counterparts. The Austrian Riesling we taste redeems the white-grape-team though, with the floral notes on the nose giving way to delicious hints of lime peel and white peach as we taste it. 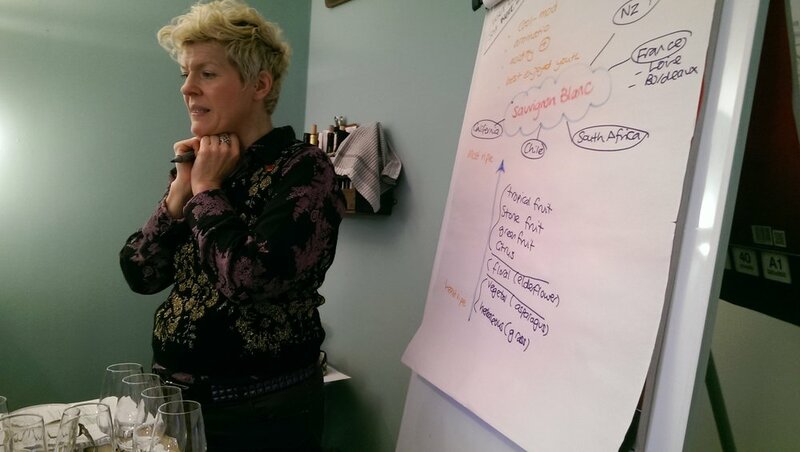 WSET Level 2 and 3 Wine Tutor Melanie in full flow! !